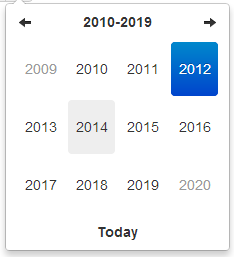 Bootstrap form component to handle date and time data. 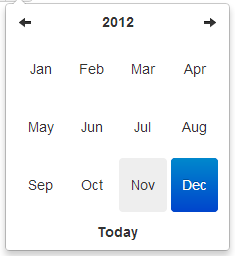 This project is a fork of bootstrap-datetimepicker project which doesn't include Time part. Some others parts has been improved as for example the load process which now accepts the ISO-8601 format. I've copy/pasted the forked project's documentation and added my specifications. Don't hesitate to download and try it ! Requires bootstrap's dropdown component (dropdowns.less) for some styles, and bootstrap's sprites (sprites.less and associated images) for arrows. All options that take a "Date" can handle a Date object; a String formatted according to the given format; or a timedelta relative to today, eg '-1d', '+6m +1y', etc, where valid units are 'd' (day), 'w' (week), 'm' (month), and 'y' (year). The date format, combination of p, P, h, hh, i, ii, s, ss, d, dd, m, mm, M, MM, yy, yyyy. Whether or not to close the datetimepicker immediately when a date is selected. 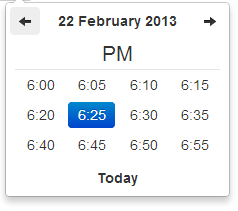 The lowest view that the datetimepicker should show. 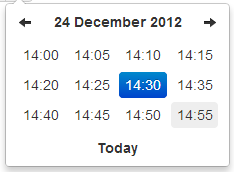 The highest view that the datetimepicker should show. 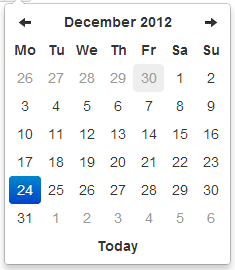 If true or "linked", displays a "Today" button at the bottom of the datetimepicker to select the current date. If true, the "Today" button will only move the current date into view; if "linked", the current date will also be selected. Whether or not to force parsing of the input value when the picker is closed. That is, when an invalid date is left in the input field by the user, the picker will forcibly parse that value, and set the input's value to the new, valid date, conforming to the given format. The increment used to build the hour view. A preset is created for each minuteStep minutes. This option is currently only available in the component implementation. With it you can place the picker just under the input field. Format as component with reset button to clear the input field. 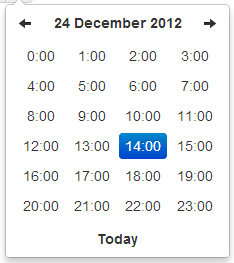 Remove the datetimepicker. Removes attached events, internal attached objects, and added HTML elements. 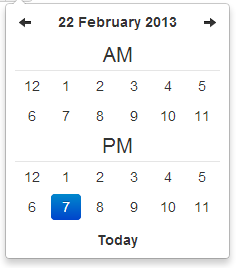 Update the datetimepicker with the current input value. Sets a new lower date limit on the datetimepicker. Sets a new upper date limit on the datetimepicker. Datetimepicker class exposes a few events for manipulating the dates. Fired when the date picker is displayed. Fired when the date picker is hidden. Fired when the date is changed. Fired when you pick a date before the startDate or after the endDate or when you specify a date via the method setDate or setUTCDate. With the ctrl key, up/left will move backward one year, down/right will move forward one year. Shift+ctrl behaves the same as ctrl - that is, it does not change both month and year simultaneously, only the year. The escape key can be used to hide and re-show the datetimepicker; this is necessary if the user wants to manually edit the value. When the picker is visible, enter will simply hide it. When the picker is not visible, enter will have normal effects - submitting the current form, etc.